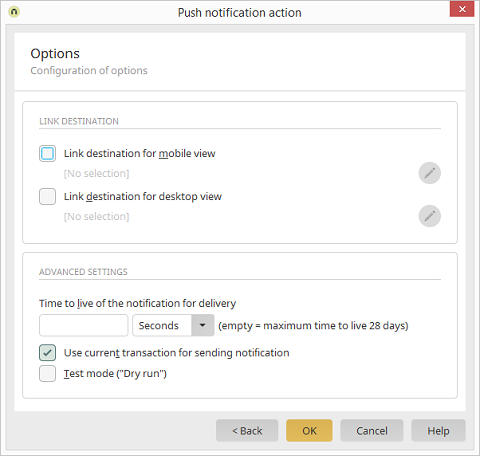 With these settings, a link destination can be defined that will open when a user clicks on a push notification in the mobile app. Depending on the portal layout, which is being used in the mobile device at the time, the corresponding link destination (mobile or desktop) will open. In each case, opens a dialog where the link destination can be defined. This setting determines how long the notification is preserved, if the mobile device of the recipient is offline. Enter the length of the time to live here. The desired unit (seconds, minutes, hours, days) can be selected from the drop-down list. If this field is left blank, the maximum time to live is 28 days. This setting means that the notification is sent asynchronously internally. This option is preselected - if an error occurs, a notification will not be sent. With this setting, the query to the notification service can be tested without actually sending the notification.